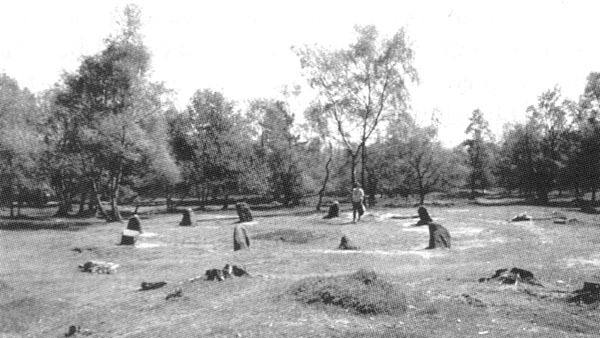 This is the last part in the account of our time at the Nine Ladies stone circle in Derbyshire. In this part I relate how we attempted some psionic experiments, I get to talk with the Wishing Tree, and we stumble upon the haunt of some exponents of sacred geometry. Oh yes, it’s all going on in this part of the tale! We really start pushing it now! At the end of the last post we had been trying to figure out the unusual response (one rod straight ahead, one turning to point back at you, or swivelling round). We were thinking along the lines of Kal being attuned to male energies, whereas I was more attuned to female. On this full-moonlit night it seemed as though I was finding it easier to tune it to some of the features of the site in particular. We decided to begin some experiments. We asked for the best place to do some energy work, and were each directed to a different power centre. Oddly, Kal was standing on the one where he had planted his umbrella, which I had taken to be the one I would go to. Oh no. I was directed to stand in the one that Kal had been sitting in, and had dowsed into a spiral earlier. So be it. We decided beforehand that we would try to get into a state of mind where we might be able to connect to each other. The two power centres were linked by arcing neutral energies, connecting male to female, and travelling over and under in a vertically circular trajectory. We hypothesised that we may be able to send each other images. I tried to relax on the power centre, but I had a Kings of Leon tune running around in my head that wouldn’t shift. It kept repeating the same refrain. This was not funny! I was trying to work here! No good. I was mainly ‘awake’ and could tell my focus was wandering – what was Kal imagining, would it be a shape, or an animal? Oh, dear. This was hopeless! Despite the stillness of the dark night I kept dropping out of trance at the slightest sound – a distant rumble, a passing car on the hillside, a hooting owl, a gust of wind. “Do I need to clear myself through this stone to regain my connection (with nature and the circle)?” I asked. The rods crossed for a ‘Yes’. I put the rods down again and placed my hand on the stone instead of sitting on it I started to tune in. My mind started to gently swirl around like someone had taken the sink plug out and my brain was draining its water into the stone! Then it got faster. The vortex in my head reached such a pace that it sent me dizzy! I spun away from the stone, but kept turning around and around, staggering like a drunk whilst laughing elatedly at the madness of being spun around. My head was swimming in a really fun way, like having spun yourself around a broom handle and then tried to walk in a straight line. Kal just stood looking on curiously as I waltzed around giggling and laughing. I asked something, anything, to give me a hand here! Couldn’t something help me to get out of this tailspin? A split second later I was prodded forcefully right in the back of the neck by one of the Wishing Tree’s branches! I jumped – woke up – and stopped spinning, thankfully. “Thank you!” I responded with genuine gratitude. I felt a warming under the tree’s canopy the air got lighter and more friendly. We had re-established a connection! That was just great. Now I was really happy, not giddy. Back to the dowsing. Time must have been drawing on, but really I didn’t care what time it was. It wasn’t important. I had to know more before we left the site. Rods in hand I walked back to Kal in the circle to continue trying to locate some connections and flows. The first thing we found were the male and female spirals coming out each stone. Just like many other sites, but with the male spirals on the inside, and female spirals on the outside. Other sites have it the other way around. Next we located the neutral lines that went between the stones. I went for the concept of opposing stones being connected and found a connection for each pair. Oddly, all of the lines were perfectly straight except for one, which bent back into the circle stone in a short curve. Was it going bending in order to avoid something? It seemed to coincide with the avoidance of the location of the two power centres we had been standing on. Noted anyway, if not understood. Kal, however, had found a few connections that were not a part of this perfect ‘spoked wheel’ pattern. Some stones connected with others that were not directly opposite. We vowed to return to map them all when it was lighter and we could draw them out. Whereas our sketches of energy patterns at sites are representational (and not always to scale) you should compare them with those of StoneDowser on his site (listed also in our links section on the right hand side of this page). Mr. Ian Honeygood, now sadly passed away, was quite precise in some of his diagrams, although he only seemed to recognise two types of line: a radial spoke and a ‘ritual path’, which he surmises was the path taken by the worshippers at the sites. Well, that concept doesn’t convince me, I’m sorry to say, but that’s a discussion for another day. Either way, he has done some accurate and helpful diagrams to show those two types of energy formations. StoneDowser’s ritual path is what I would call the unwinding of the nemeton of the site. Like Hamish Miller we often find three (he finds more, but then he’s like that) circles of male energy enclosing sites, and this energy trail then comes into the site to spiral to a point which we usually confirm as being a power centre for one of us (i.e. male or female oriented energies dwell in or emit from these points). Each time around the three outer spirals of the male nemeton energy the path gets closer to the stones. At Nine Ladies it started about three feet away from the stones, going to about one and a half feet, then six inches for the last time around. The path then turns into the ‘entrance’ of the site before looping into a spiralling energy centre. On my last visit to Nine Ladies I had dowsed a link between the Wishing Tree oak and the main power centre, coming into the site via the ‘entrance’. I decided to verify if that was still present or not. It was. Exactly the same path, same entrance point, same power centre, same direction of spiral, everything. Good. Consistency was being achieved in some of this dowsing now. As we were near the tree Kal decided to try his luck in doing a bit of communing with it. Now, I have already recounted my own difficulties with this species, and particularly this tree. It is amenable to contact, but it has to be handled very carefully and with great patience. Kal is, how can I put this, not one for such finesses! In all openness and in his usual hearty style I watched him outstretch a metaphorical hand of welcome. And then I watched him knock his head on a low branch and stumble over a tree root. I pretended I hadn’t noticed this blatant rebuttal. He tried again, complaining to it that he was trying to be nice. Nothing. What did he expect? He was not one for the patient building of relationships that such communications often insist upon. His talents lie elsewhere, I guess. I tried to wipe off my wide smile. “Give up, mate!” I implored. He was fighting a losing battle, it seemed. One thing we both noticed about the site that night was how slow the energies were. As we dowsed them we walked slowly; as we circled the site the energy plodded along with us but didn’t overtake us as it has at other circles in sunlight, or my time at Moel-Ty-Uchaf. The Genius Loci was docile this evening. Nocturnal nature, however, was wide awake. Occasionally we would get a hint of agreement at just the right time whilst dowsing or communing – a sudden gust of wind, or a hooting owl would chime in at just the apropos moment. As we wandered back to the car I asked if we could try to see what kind of place might be benefiting from the flow of energy that I knew went down the cliff edge via a steep gulley. Kal was game, so we drove down a side of the hill that I had never been down before. Kal said this was the way he often came up, so I was confident we could find our way back to the Bakewell area pretty easily soon enough. Ten minutes later Kal was saying, “Well, I’ve never been in this bit before!” as we trundled curiously through a small town that suddenly arose next to a river. We passed a pub called “The Square and Compass” and that struck a chord – that was a masonic sigil. It would seem that Darley Dale, as the place turned out to be, was home to at least one group of people who were interested in ancient secrets! Societies are not for me, however. My path is mainly alone or with Kal, and my progress is swift because of that, I feel. It’s my path I’m treading, not following someone else’s agenda. a) The rules of the collaboration with Nature must always be followed to get good results – a quiet mind is essential; good strong intent; a clean body (not caffeine-fuddled, tobacco doesn’t help the cause either); be prepared for fun, but do your work seriously and focused. c) Moon energy is slower, possibly weaker than sun energy. Certainly it is less vigorous. d) A stone in or close to the circle, usually flat, acts like a solar, lunar and stellar panel that absorbs the radiant light. e) In moonlight, on the correct power centre, we were both unable to experience any intuitive responses either between each other or towards any external location. The EMF was supposedly low, as it was night time. A lecture by Serena Roney-Dougal taught us that at times of low EMF are more favourable for telepathy and remote viewing. I blew that experiment by not being able to quieten my mind. f) Although StoneDowser didn’t dowse this site (to our knowledge) his ‘ritual path’ was present – a spiraling line coming from outside to inside the circle. The radial links between the stones that he drew at other sites were also there. We thought that the lines bent between some stones sometimes, and that there were more links than simply those that were opposing stones. It would seem that manifestation patterns can be willed into a particular shape, although my intention got transformed whilst I was forming it in my mind. Is this due to an interactive collaboration between human and nature, or was I simply unable to hold a shape using my willpower? The shape dowsed as increasingly complex when Kal came to verify it. I also verified Kal’s shape too. “Thaat be a pentangle, and no mistake, zurr.” What is it about wizards and their five-sided shapes?